OAKLAND -- The long goodbye to Oracle Arena begins Tuesday night. The Warriors' final season in Oakland begins most impressively, with the pregame distribution of NBA championship rings and the raising of the banner. Pregame shows on NBC Sports Bay Area begin at 5 p.m., with tipoff for the TNT telecast scheduled for 7:40. 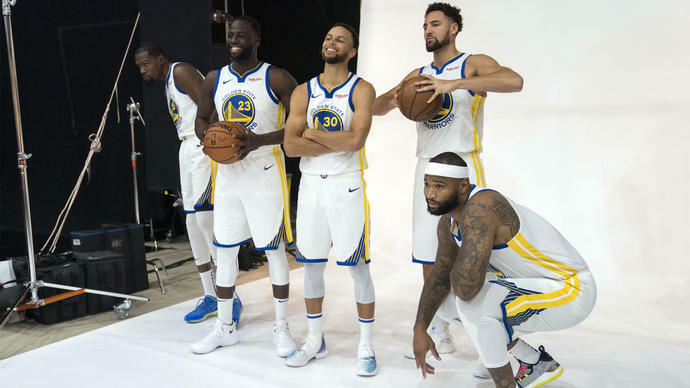 The Warriors realize they must quickly get past the ceremony celebrating the past, or else they run the risk of being humbled by the Oklahoma City Thunder, a team that has made the playoffs eight of the past nine seasons. In a similar setting last October at Oracle, the Warriors collected their rings, built a 13-point first-half lead and expanded it to 17 in the third quarter before fading in the fourth and losing 122-121 to the Houston Rockets. -- C DeMarcus Cousins (Achilles rehab) is listed as out. G Shaun Livingston (foot soreness) is listed as questionable. -- C Steven Adams (lower back stiffness) is listed as questionable. G Andre Roberson (patellar tendon surgery) and G Russell Westbrook (knee arthroscopic procedure) are listed as out. Green missed the vast majority of training camp and the preseason schedule, so his minutes will be limited. He'll probably play in the range of 22 to 26 minutes. . . . Jordan Bell and Kevon Looney likely will see playing time at forward, to spell Green, but also at center, where they will share time with Jones. . . . Warriors coach Steve Kerr likely will use a nine-man rotation -- 10 if Livingston is available. If Adams can't go, Nerlens Noel likely will start at center. . . . Westbrook's absence during the preseason pushed Diallo, a rookie from Kentucky, into the starting lineup, but expect veteran Raymond Felton to be a part of a rotation primarily employing three guards.